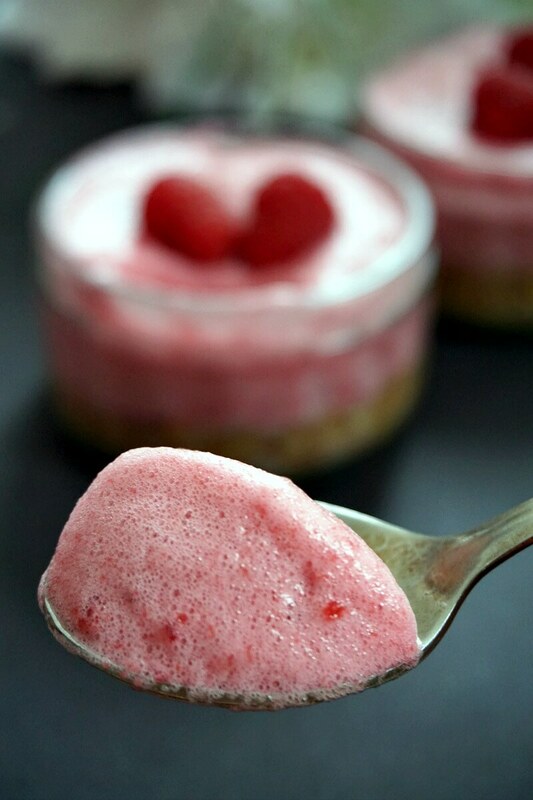 Low-Carb Raspberry Mousse Cheesecake (Vegan, Gluten Free), a healthy dessert for Valentine’s Day, but super delicious and easy to make. It’s that time of the year again when love is celebrated with red and pink colours, and loads of sinfully sweet treats. 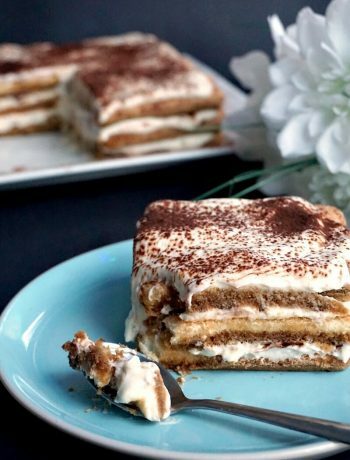 But how about we go for a healthier option instead, and make a guilt-free dessert that is as delicious (and sweet), but without anything heavy and heaps of refined sugar? And the answer to this is a super light, completey vegan and low carb cheesecake with raspberry mousse filling. It looks like a hard job, but it’s actually super simple to make, once you organise yourself and have everything around. All you need is a good blender for the cheesecake base, and a good mixer for the aquafaba filling. How do you make a low-carb cheesecake base? Regular cheesecakes use a melted butter and crushed biscuits (crackers) base, but for our low-carb version we use 2 simple ingredients: cashew nuts and dates. And nothing else. No need to soak the nuts beforehand either, just add them to a blender and blend until you get a smooth paste. If you fancy a more flavourful base, try adding dessicated coconut or coconut butter, otherwise, we are good to go. Just spread the mixture over your preferred pots or even a smaller cake tin, and use the back of a glass or a spoon to make sure it’s a firm base, then chill. Now, I have used aquafaba before and it’s an excellent substitute for egg whites. 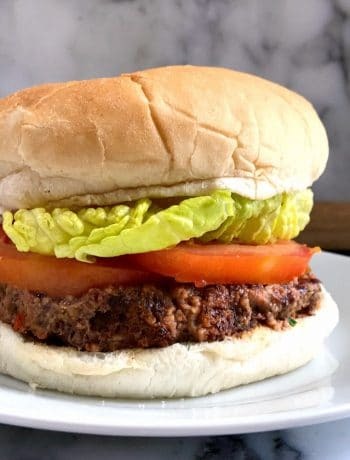 It’s completely vegan, it hasn’t got any strong taste, and it can be whipped to perfection. 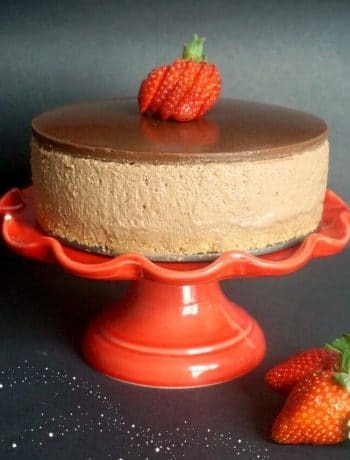 I used the same techique for my Vegan Chocolate Mousse with Aquafaba and it was brilliant. Now, all you need to do is get a can of cooked chickpeas, reserve the liquid, add it to a bowl and mix well until it holds soft peaks. It’s not as fast as whipping a regular cream or white eggs, it takes at least 10-15 minutes, but do not despair. It does work. Add the granulated sugar and continue to mix until it holds stiff peaks. The sugar helps it get that meringue- like consistency, so do not omit it. Can you make raspberry mousse without gelatine? The answer to it is it depends. If you make a raspberry cheesecake in a large round cake tin, then you need the gelatine or its vegan substitute, agar-agar. Without it, the mousse will collapse when you try to slice it. Now, if you make small individual pots, it does not matter that much if it’s super stiff of not. I did use agar-agar though, it holds it shape a lot better, and looks nicer too. 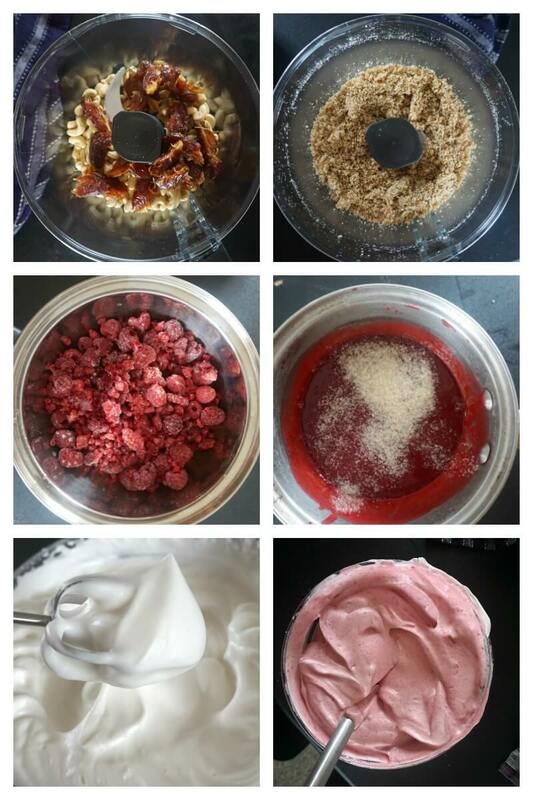 How do you make a vegan raspberry mousse? To make the mousse, add the raspberries to a pan together with the lemon juice and maple syrup, and bring to a boil. Continue to cook until it’s reduced by half, then blend the mixture, pass it through a sieve, and add it back to the pan. Sprinkle over the agar-agar, and leave to cook for 3-4 minutes until it becomes like a jelly. Leave to cool, then gently fold in the aquafaba, and mix well until it’s fully incorporated. Distribute it evenly before the cheesecake pots, and refrigerate for at least 2-3 hours. It tastes a lot better chilled from the fridge, and it’s absolutely delicious, just like the real deal. 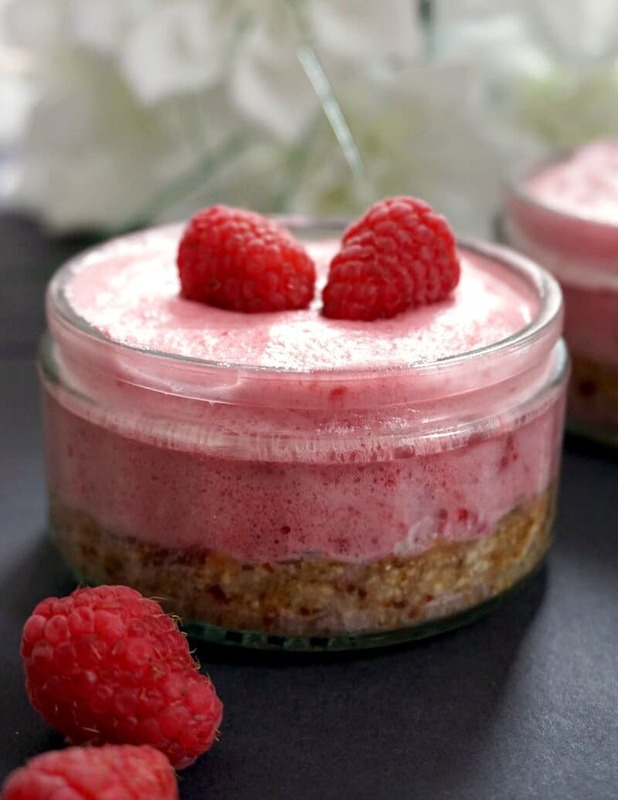 If you’ve liked my LOW CARB RASPBERRY MOUSSE CHEESECAKE (VEGAN, GLUTEN FREE) or any other recipe on the blog then don’t forget to rate the recipe and let me know how you got on in the comments below, I love hearing from you! You can also FOLLOW ME on FACEBOOK, and PINTEREST to see more delicious food and what I’m getting up to. 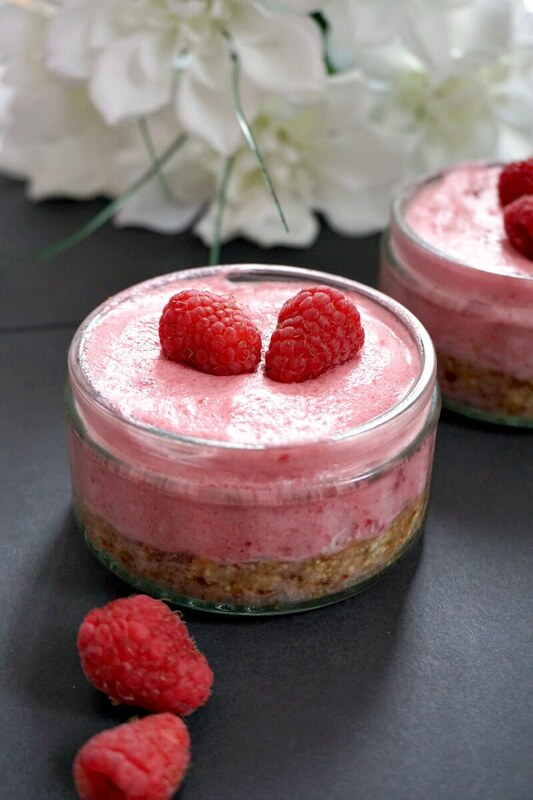 Low-Carb Raspberry Mousse Cheesecake (Vegan, Gluten Free), a healthy dessert for Valentine's Day, but super delicious and easy to make. To make the base, add the pitted dates and cashew nuts to a blender, and blend until it forms a smooth paste. Divide it evenly between 6 individual pots, pressing down firmly. Add the raspberries to a pan together with a quarter of a glass of water, maple syrup and lemon juice. Leave to cook until it reduces by half, then add it to a blender and blend until smooth. Pass it through a sieve to remove any bits, then return it to the pan. Sprinkle over the agar-agar, and leave for cook for a further 3-4 minutes until it becomes like a soft jelly. Leave to cool. Add the chickepeas liquid to a large bow, and mix well until it form soft peaks. It takes about 10-15 minutes to get to this stage. Add the granulated sugar, and continue to mix until it form stiff peaks. Gently fold it into the raspberry jelly until all combine. The mixture has a pink colour. 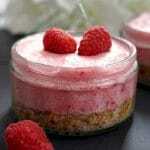 Top the cheesecake pots with the raspberry mousse, then refrigerate for at least 2-3 hours.